Open from Tuesday till Saturday from 10am to 5pm. Sundays and holidays closed. Monday strictly by appointment. 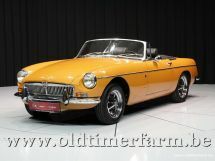 The MGB is a sports car launched by MG Cars in May 1962 to replace the MGA and manufactured until 22 October 1980—originally by the British Motor Corporation and later by its successors. 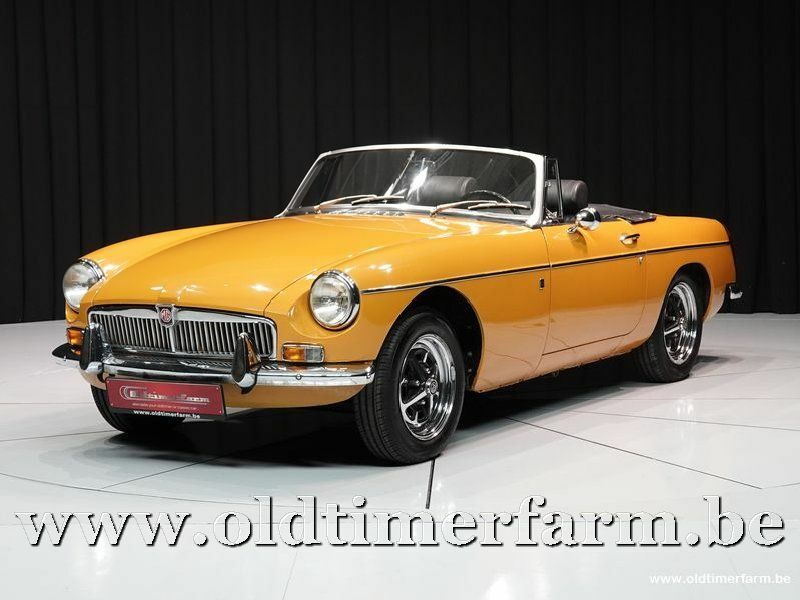 MGB production continued throughout restructuring of the British motor industry, and the parent company’s transition from BMC to British Motor Holdings (in 1966) and to British Leyland Motor Corporation (in 1968). 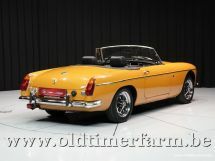 The roadster was the first of the MGB range to be produced. The body was a pure two-seater but a small rear seat was a rare option at one point. 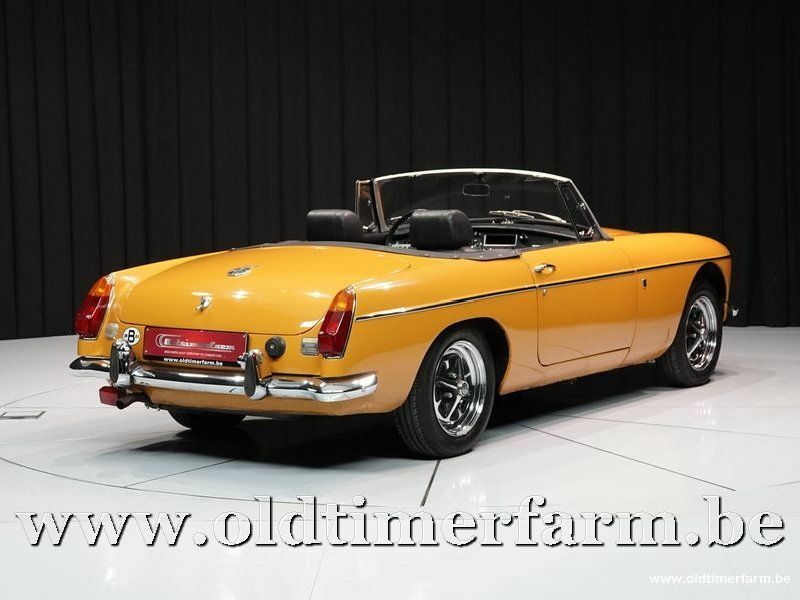 By making better use of space the MGB was able to offer more passenger and luggage accommodation than the earlier MGA while being 3 inches (75 mm) shorter overall. The suspension was also softer, giving a smoother ride, and the larger engine gave a slightly higher top speed. The four speed gearbox was an uprated version of the one used in the MGA with an optional (electronically activated) overdrive transmission. Wheel diameter dropped from 15 to 14 inches (360 mm). In late 1967, sufficient changes were introduced for the factory to define a Mark II model. Changes included synchromesh on all 4 gears with revised ratios, an optional Borg-Warner automatic gearbox (except in the US), a new rear axle and an alternator in place of the dynamo with a change to a negative earth system. To accommodate the new gearboxes there were significant changes to the sheet metal in the floorpan, and a new flat-topped transmission tunnel. All models are rear-wheel drive. To meet US safety regulations, later North American tourers got three windscreen wipers instead of just two (to sweep the required percentage of the glass), and also received a plastic and foam rubber covered "safety" dashboard, dubbed the "Abingdon pillow". Other markets continued with the steel dashboard. Rubery Owen ROstyle wheels were introduced to replace the previous pressed steel versions in 1969 and reclining seats were standardized in 1970. 1971 also saw a new front grille, recessed, in black aluminium. The more traditional-looking polished grille returned in 1972 with a black "honeycomb" insert. 1970 saw split rear bumpers with the number-plate in between, 1971 returned to the earlier five-piece style. Stay informed about our promotions, new cars, events and news. Please fill in a valid e-mail address. Your email address has been successfully added to our mailinglist.